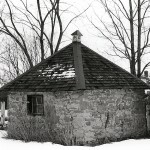 This small smokehouse is a remnant of the pioneer domestic economy which characterized the village in the nineteenth century. It reflects a time in Richmond’s history when almost every family had its own garden and probably also, chickens, a pig(s) and a cow(s). This particular building has long been a village landmark as local legend connects it to Maria Hill Taylor. Maria Taylor owned this land until 1879 so it is quite possible that the smokehouse was built while she owned the property. The 1851 census shows that this was a relatively prosperous household as the home was 1 of only 2 two storey frame houses in the village. Who was Maria Hill? Maria and her first husband, Sergeant Major Andrew Hill were both veterans of the War of 1812. Highly regarded by the soldiers and trusted by the officers of the 100th regiment, Sergeant Major Hill was in charge of the men who cleared the way from Richmond Landing on the Ottawa River to the village and worked distributing supplies to the soldier- settlers from 1819-1822. He was noted for having the first ox and cow in the young settlement. His wife, Maria Hill, was an unconventional character who dressed in men’s clothing and served as a medical orderly in the Niagara Campaign of the War of 1812. The soldiers considered her a heroine and she was a community leader. She was noted for being an excellent cook and the hotel became a social centre for the village hosting regular meetings of the Orange and Masonic Lodges from as early as 1820. Their Hotel was probably located on lot 10 on the west side of McBean St. but would have faced Strachan St.
Andrew Hill died in 1830 and Maria remarried. She and her second husband, Andrew Taylor, opened a Hotel further south on McBean St., in 1840. The smokehouse was part of that complex of buildings. The 1863 map of Richmond shows Mrs. Hill (Taylor) still owning this land as well as the building on Strachan St.
Land records indicate she sold lots 13, 14, and 15 on McBean Street which included the smokehouse to Ann Mylne in 1879. 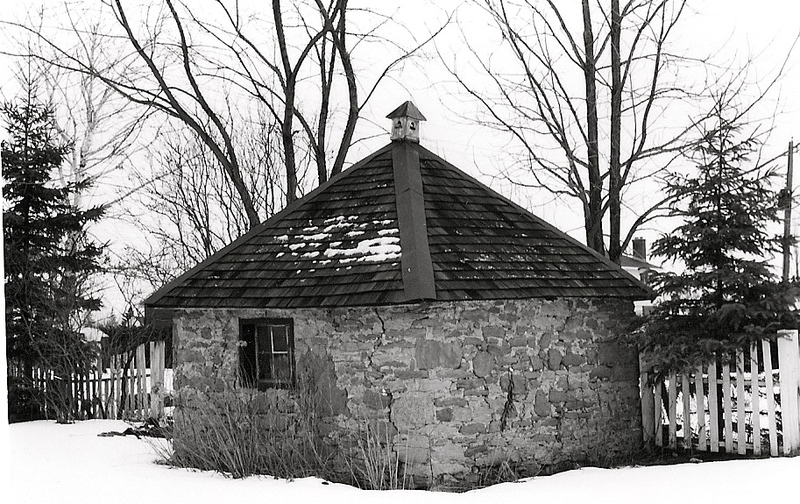 The smokehouse is similar in appearance to many other nineteenth century smokehouses. It is a square building built of rubble stone. The hipped roof was topped with a vent as shown in the above picture but it has been removed. This entry was posted in industry, Locations, Personalities and tagged Industry. Bookmark the permalink. Thank you. Very interesting. In his book “The Honour of Richmond” David Morris adds that Maria came from Lancashire in England and that her original surname was Glennan. What Morris calls “The Richmond Arms” was “the only place thought good enough to provide (the Duke) with the food and comfort he deserved”. He adds that Maria “suffered some extraordinary hardships” during the battles. The book’s title refers to a gift of a large area of eastern England by William the Conqueror to the Duke’s ancestor. It was published by William Sessions of York, England in 2000. I am reading about the Richmonds’ history as we try to keep open our local pub The Richmond Arms in Bath, England. See the coat of arms on the Facebook site called Save the Richmond Arms. It is in a street called Richmond Place, but when built in 1792 it was called America Buildings according to an old map. Often wondered about a transatlantic connection. How famous was the Duke’s death at the time I wonder ?